There are a couple times each year when the sports calendar graces us with a weekend worthy of posting up on the couch and enjoying a plethora of meaningful events... And then there is this weekend. While the NFL playoff schedule will give us some intriguing matchups over the next two days, the Patriots have earned the right to take wild card weekend off. Don't worry, there will be plenty to keep you busy while the Texans and Bengals battle for the right to in all likelihood get stomped in the divisional round. Being in the eastern time zone, it is rare that we get to wake up to a great game. Beginning at 9:30, NESN will be replaying game 7 of last year's finals. A game that will never really get old, it really won't be a bad way to start a day. The 4-0 outcome of that game seems like a nail biter compared to what this year's squad has been doing to the rest of the NHL. After Thursday's 9-0 blasting of Calgary, the B's have now reached 6 goals 11 times in 37 games this season. Next in line are Toronto and Pittsburgh... with 4. Hopefully more of the same will be on hand as the Canucks make their only trip to Boston this season for the lone rematch of the year. Vancouver, never shy in their soft ways, has already decided to sit Stanley Cup goat Roberto Luongo for Corey Schneider. The former BC star, Schneider has proved to be one of the top backups in the league, and he will be tested early and often against the potent Boston lineup. Most of the time in situations regarding finals rematches the following year, the runners-up always seem more motivated than the defending champ. This game gives off no such vibe, as the emotions and hatred the Bruin players developed last June are not the kind to go away lightly. Neither team has had drastic changes to their lineup, and the Vancouver villains remain in blue and green. The Sedin sisters, Alex Burrows (the biter), and flop master Maxim Lapierre will all be back on the ice tomorrow. To cap off the day, you'll be able to catch two NFL wild card games at 4 and 8pm. 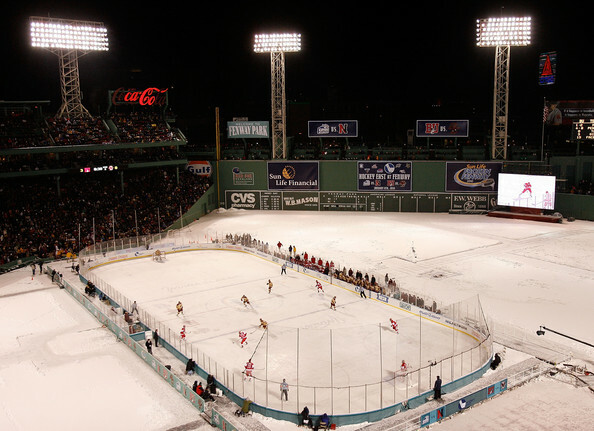 With Cincinnati and Houston doing nothing for me, I'll be making my way up to the Frozen Fenway doubleheader. College hockey is not exactly the sport of choice for anyone who did not attend a school rich in hockey tradition or grow up into it. However, the allure of bitter rivalries, throwback jerseys, and an ice rink at Fenway Park should be enough for any real sports fan to tune in. The first game is between UVM and UMass, and the marquee event will showcase one of the top rivalries in all of college sports between UNH and Maine. These schools have met for the national championship, produced dozens of NHL stars, and two years ago each had a finalist for the Hobey Baker Award, the equivalent to the Heisman Trophy in hockey. Unlike the Heisman, only 3 players are voted finalists for the trophy, making the feat all the more impressive to have neighboring schools produce 2/3 of the top talent in the NCAA. This is by far the most anticipated game since I was introduced to UNH hockey as a freshman in Durham, NH in 2006. So find a couch (or a bar), enjoy good company, and start the New Year off with a bang. If you aren't into hockey but love Boston sports (presumably why you're reading this), and you were ever going to sacrifice one day to really give the sport a chance, make it tomorrow.